Finally! As anticipated, me felted scurvy scoundrel, Cap’n Weird Beard, be complete! Ready to depart in the beat of a heart, to find adventure… and booty! 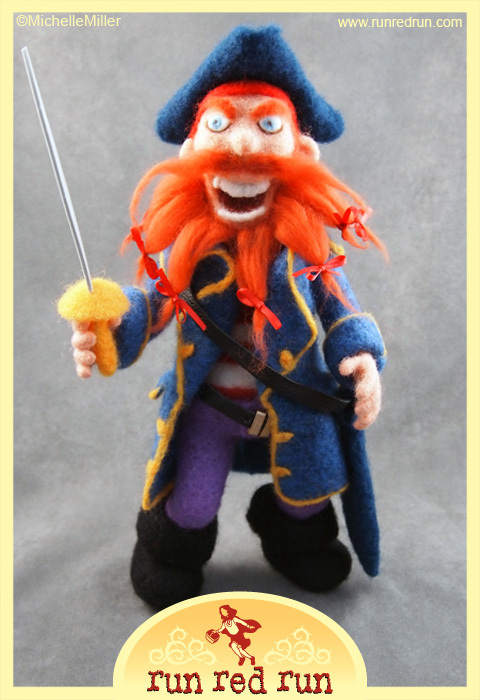 He’s all wool, needled felted by hand… but in true pirate form, has a few non-woolen accessories: sword, leather sash, leather belt, beard ribbons, and gold ear rings. Along with that he also has a removable felted tricorn hat. Since I’m a huge Disney fan, this guy was inspired by the Disney Pirates of the Caribbean ride and ride posters. Which explains why he’s very colorful and cartoony. But for some elements, the inspiration left some wiggle room — for instance, what kind of shirt is he wearing? What about his pantaloons? In those cases I had to use my imagination to come up with an appropriate solution. As always, there are more photos up in the gallery. Connor says your pirate is “really nice..and cute!” Very cool! Thanks, Nicole! I’m glad Connor liked him. 🙂 Thanks for checking out my site! Definitely going to do this! Thanks!